3-in-1 Robot Kit – Three forms for different scenarios: robot tank, self-balance car, and 3-wheel car. Wireless Control – Makeblock HD provides existing projects which enable you to interact with Ranger immediately. Push the button to control Ranger wirelessly and start having fun! Ready-to-use projects built-in Makeblock HD app for immediate fun and play. ”¢ Graphical programming mBlock for kids to learn entry-level coding. Powerful Mainboard – Latest Me Auriga main-board provides not only 5 on-board sensors, but also 10 extension ports that enable you to add more functions. Numerous online courses and guides for fur-ther study and development. Free Online Courses – 16 chapters of courses on graphical programming with Ranger, help-ing kids to enjoy the fun of programming in various game scenes step by step. 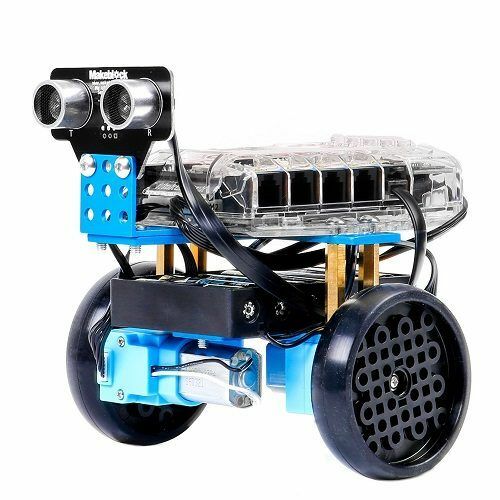 Makeblock MBot Ranger Robot Kit is a three-in-one STEM educational robot kit which supports 3 building forms: robot tank, three-wheel racing car, and a self-balance car. Program & Control mBot Ranger via iPad, tablets, or laptop to start your exploration!